Fundraiser by Red Wedge : Get our editors to London! Get our editors to London! We are pleased to announce that our editorial board has been invited back to London to present at this year's Historical Materialism Conference happening this November at the School of Oriental and African Studies, but we need your help getting there! As most of you know, Red Wedge Magazine is an unpaid labor of love curated and run by a dedicated editorial team of four and as capitalism would have it, all of us have "day jobs" (in some cases 2 or 3 "day jobs") and pour any and all free time to making Red Wedge the place for engaging art and culture from a decidedly political Marxist perspective. We are the only English-language Marxist cultural website and publication dedicated to all highlighting, promoting and making accessible all aspects of creative culture–art, music, film, poetry, fiction, dance, etc. We believe that art and creativity aren’t just side issues to the fight for a radically different future, but rather, integral to it. In fact, we believe that the ability of ordinary people to imagine something different is essential to advancing our vision of a socialist society, and we seek to highlight art and analysis that help feed this radical imagination. In a similar vein, Historical Materialism is a Marxist journal based in London which holds annual conferences all over the world from Australia and Lebanon to Canada and New York City, and its flagship conference in London. Over the last nineteen years, Historical Materialism has become a key place for socialist and radical thinkers to discuss the heady ideas related to a total transformation of society in a fresh light. This is done in the spirit of asking what works and what doesn’t in order to rebuild a vibrant, thinking socialist movement. So what can Red Wedge bring to Historical Materialism this year? We believe the weakness of contemporary cultural production is connected to a mutually reinforcing dyad of cultural disbelief in an alternative to capitalism (i.e. “There Is No Alternative”) and the real-world defeats of the past few decades. The imaginative center of the socialist brain has been deprived of oxygen and we see ourselves among the caretakers of a kernel of something different that can help get it breathing once again. We want to debate with and learn from other cultural Marxists and do our modest part in enlarging and enabling a new popular avant-garde that can engage the intellectual and real-world ruins that surround us. Historical Materialism brings out academics, yes, but more importantly it brings out people – both in academia and outside of it – looking to better understand capitalism’s strengths and weaknesses in order to take what we learn back to our workplaces and campuses and other sites of struggle to reinvigorate and advance are revolutionary work. Avant-Garde” by Crystal Stella Becerril. 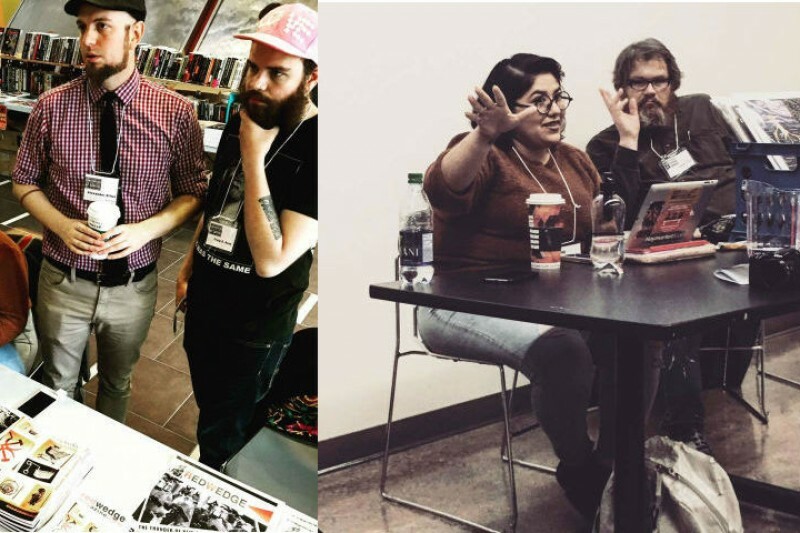 As we mentioned above, we, the dedicated editorial team behind Red Wedge magazine, are struggling members of the destitute working-class in the U.S. trying to make a living while at the same time working to advance discourse around art and revolutionary politics. We are adjuncts and service workers; manual laborers and freelancers; working artists and revolutionaries and we desperately need your help getting out to London. If it is within your financial means to donate (any amount, however small, helps!) to our travel fund, please consider doing so. If it is not, we'd sincerely appreciate it if you took the time to share our GoFundMe page with your social, familial and where appropriate, your professional networks. We'd like to extend a sincere thank you for all of the support you have given us over the years. We look forward to continue engaging you all in the years to come. A PDF of a new Red Wedge poster, specially designed for election season, featuring text adapted from Charlie Chaplin's famed "The Great Dictator" speech. We are designing a digital "Hallow'zine" for the approaching scary season, featuring the best of our content on horror and the macabre. Ten bucks gets you one. A hard copy version, mailed to you, of the above mentioned election season Chaplin poster. A limited edition special print by our own Craig E. Ross, featuring famed anti-slavery rebel John Brown. Mailed to you. Wish he were still with us to come to Berkeley for a performance.